In 2003, the General Assembly designated Folkmoot USA as the official State International Festival (Session Laws, 2003, c. 315). The appointment of a State International Festival has been under debate since 1992, when Rep. Charles Beall of Haywood County presented a bill to give Folkmoot, USA the honor. He was met with opposition from representatives of Fayetteville, North Carolina where the Fayetteville International Folk Festival is held. The bill was dropped, only to be brought back the next year. Eastern legislators proposed naming the Folkmoot festival the State Western International Folk Festival and the Fayetteville festival the State Eastern International Folk Festival. Folkmoot managers disagreed with the claim, stating that the nature of the two festivals were entirely different and should not be referred to with the same title. Folkmoot, USA was a two week long festival bringing in international groups representing their home countries, while the Fayetteville festival was a one day gathering with American residents of foreign descent. The bill was once again dropped. 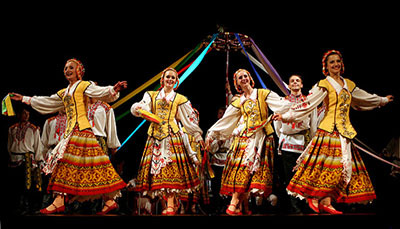 In 2003 Folkmoot was eventually designated the sole State International Festival of North Carolina. Folkmoot, USA is an annual two week international festival founded in Waynesville North Carolina, to promote the cultural exchange of traditional dance and music. Its name comes from an old English word meaning "meeting of the people." Their goal is to "celebrate diversity and differences, encourage cultural conversation and inclusion, and preserve and honor worldwide cultural heritages, especially using dance as a tool to achieve world peace." Folkmoot was the idea of local Waynesville surgeon Dr. Clinton Border who thought that North Carolina's rich traditional culture would make it ideal for hosting an international heritage festifal. The first festival was held in 1984 and featured perormers from England, Germany, Holland, Ireland, Turkey, Mexico, Puerto Rico and India. Since then, over 8,000 performers from 200 different countries have performed at Folkmoot. The festival is held over a two week period at locations throughout Western North Carolina and now includes a year-round cultural center and non-profit organization. On average, Folkmoot, USA draws over 70,000 visitors from 40 different states. It is one of only two American festivals of its kind, and is internationally acknowledged and respected. It has also been designated “One of the Top Twenty Events in the Southeast” by the Southeast Tourism Society for more than twenty years. Recently the festival has promoted a shift from a primarily 'audience' format to that of an interactive, educational framework. New activities include dance lessons, community dinners, cultural pannel discussions, a kids camp, and educational partnerships with local schools and universities. Popular traditional events include the Parade of Nations and International Festival Day in downtown Waynesville. AN ACT TO ADOPT FOLKMOOT USA AS NORTH CAROLINA'S OFFICIAL INTERNATIONAL FESTIVAL. "§ 145-19. State International Festival. Folkmoot USA is adopted as the official international festival of the State of North Carolina." In the General Assembly read three times and ratified this the 3rd day of July, 2003. Stinneford, Mark. "It's East Vs. West In Legislative Battle Of International Festivals," Fayetteville Observer, The (NC), April 26, 1993. "International Folk Festival Planned for Waynesville," Pilot, The (Southern Pines, NC), July 11, 2003. 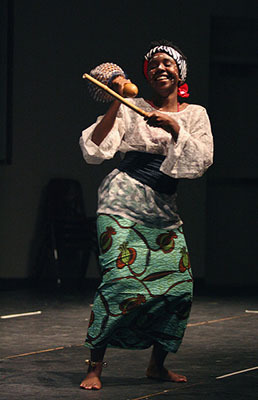 Dancers from Belarus and Togo performing on stage, Folkmoot, 2009. Image courtesy of Flickr user anoldent. Available from https://www.flickr.com/photos/anoldent/albums/72157606334279322 (accessed July 13, 2017). Folkmoot Parade of Nations. Video courtesty The Mountaineer newspaper, Haywood County, North Carolina. Available from https://www.youtube.com/watch?v=7-ec_lxDIWI 9 (accessed July 13, 2017).